I remember when I was about 6 or 7 years old and the Ma’ brought me into town on the bus, into Temple Street hospital and on the way we stopped in to the Pawn Shop in Dorset Street with a few shirts and a waistcoat belonging to the Da’. Anyway, after we were finished all our business and that the Ma’ says “Come on and we go down and visit me Aunt Kitty“. Now, this woman wasn’t in anyway related to us at all, she was an old friend of the family going back years that the Ma’ always referred to as her aunt. Aunt Kitty lived up in the top flat in a tenement house on Summerhill. Oh I hated having to walk up all of them stairs but the Ma’ used to say, if you count them going up there’ll be less coming down. Now the room that Kitty lived in wasn’t very clean or that, she didn’t have much in it, just a single bed that was all stained and damp, a big Po under the bed that was half full, an oul armchair with all the red horse-hair sticking out of it, an old sideboard with a Statue of the Blessed Virgin and the Sacred Heart Picture beside it. And of course a packet of Woodbine cigarettes. I used to stand looking out the window while the Ma’ talked to Kitty. And then one time in particular I heard the Ma’ say to Kitty “What do you mean, my Granny was in prison“? Now, years later I asked the Ma’ about that comment and she said that old Kitty must have been hallucinating at the time, because her Granny was never in prison. So in recent times I was reading through some old newspapers and came across a murder case that had happened in Dublin a very long time ago. 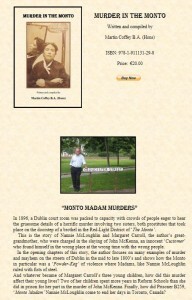 As I was looking at the names of the people involved in the murder I came across my mother’s Granny being mentioned. And murder it was alright, involving two members of my family and one of them being a Madam in the Monto. Some poor unfortunate fella was in the wrong place at the wrong time with the wrong people. 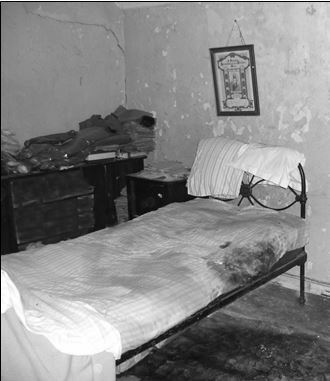 Anyway, I eventually managed to research all of the background to the story, along with original Prison Records, Arrest Records and the like and decided to publish it all in my latest book, “Murder in the Monto”. Would you ever know all the same?